Our Lake Forest apartments are located in one of the safest communities in the country, close to shopping, schools and restaurants and directly across the street from Regency Park. Lake Forest apartments are just off the Foothill Transportation Corridor and not far from the I-5 and I-405 Freeways, making it easy to commute to other areas of Orange County, as well as the Inland Empire. Not only are they a great choice for raising a family, they are also ideal for employees of Western Digital, Oakley and companies located at the Irvine Industrial Complex East. Lake Forest apartments are close to many outdoor destinations, including Limestone Canyon Regional Park with its many hiking and biking trails. The Orange County Great Park, on the site of the old El Toro Marine Base, features lakes, picnic areas and a launch pad for hot air balloons. Golfers can take advantage of the many courses in the area, including Oak Creek, Leisure World and Tijeras Creek. Lake Forest is also the site of a 40,000-square-foot public skateboard park. El Toro High is the city’s fine secondary school. There are also two public libraries. A variety of restaurants are just down the street from our Lake Forest apartments. Residents can choose from Japanese, Middle Eastern, Mexican, Pizza, Delis, Chinese and fast food, and many more options are within a few miles. Fine grocery stores, as well as big box stores like Target, can be found at the Foothill Ranch Towne Center, while Nordstrom and other national retailers are available at the Irvine Spectrum Center. These Lake Forest apartments offer luxury at a surprisingly affordable price. Apartments include vaulted ceilings, ceiling fans, spacious closets, private balconies and full-size washers and dryers. Each Lake Forest apartment also includes its own single-car garage with remote entry. The building amenities include on-site management, fitness center, tennis and basketball courts, sand volleyball court, hiking and biking trails and heated swimming pool. 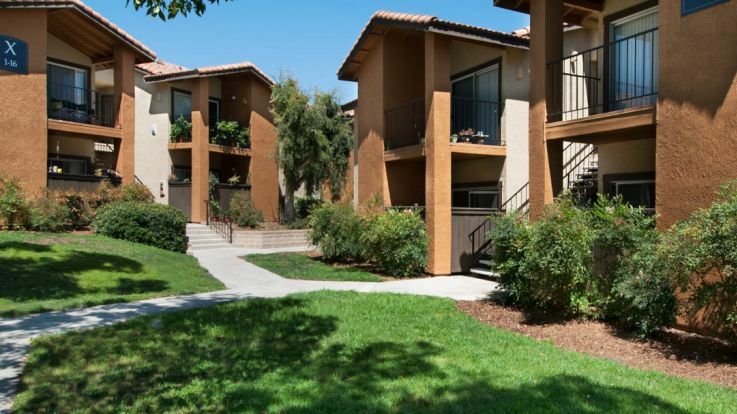 Lake Forest apartments offer luxury living in one of California's finest communities. And if they do not meet your needs, consider one of our other beautiful properties in Fullerton and Huntington Beach.